I have a confession. I am a teacher. That may not sound like a statement that needs to be “confessed” but I’m not saying this because I am ashamed. It’s more of an affirmation and it’s a statement about which I am very proud because it took me years to recognize the gifts God has given me. I had often been a bit envious of people who could declare with confidence “I am a …” (fill in the blank). Oh, I was sure of things I liked to do and maybe even some days I could admit that I was good at something but to say “I am…” I just didn’t have it in me!! To the casual observer, this might sound odd. I worked in patient education as a registered nurse, I taught Sunday school, I home-schooled my three children. But to say “I am a teacher” required a level of understanding I didn’t have. It wasn’t until I began on my journey to discover how God might use me for God’s mission that my confidence began to grow. I began to see my abilities as a gift for ministry. While I would acknowledge that this journey truly began at my Baptism some 63 years ago, it wasn’t until I started intentionally working toward recognizing God’s gifts in my life about 9 years ago that the pieces began to fit together. Assistance in understanding that all baptized persons are called to minister in Christ’s name, to identify their gifts with the help of the Church and to serve Christ’s mission at all times and in all places. Did you know it said that? I sure didn’t! And this is precisely what we were doing Wednesday evening – honoring those who have taken their life-long formation seriously and have been seeking to discern God’s gifts to use for God’s service. During our Eucharist, we remembered the Martyrs of Uganda – a commemoration that might not seem at all celebratory for our occasion! But Rev. Shaefer reminded us in her sermon that the martyrs didn’t merely teach us how to die, but rather taught us how to live by moving beyond fear to a life of faith. Knowing who we are in Christ and stepping out to use the gifts God has given is one way we can live lives of faith and demonstrate that we are followers of Jesus. Discernment is part of every Christian’s call! And our own Whitaker Institute is here to help each one of us in this task. What are your gifts? How is God using you in service to all God’s beloved children? 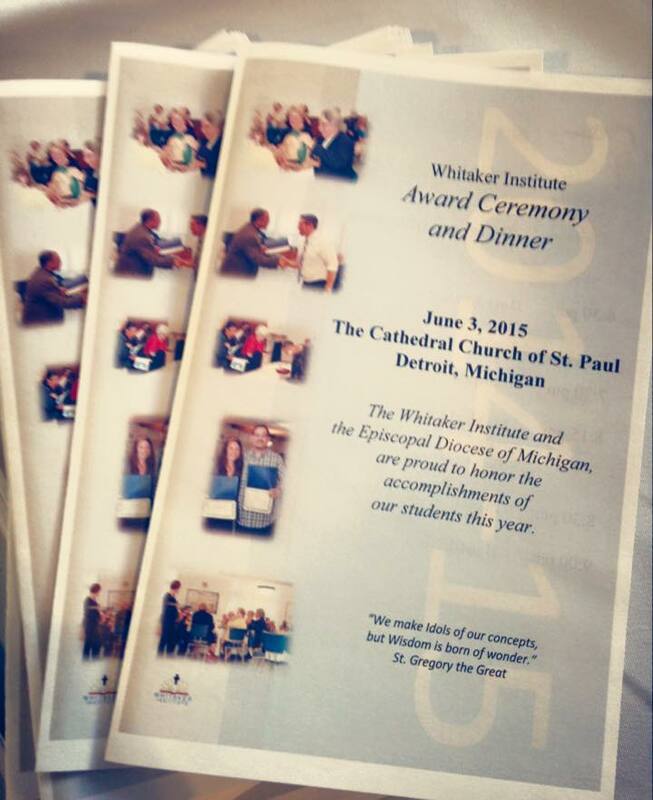 Maybe next year, we can celebrate your completion of a Whitaker class and affirm your ministry. We’d be delighted to join you!! you, in the unity of the Holy Spirit, one God, now and for ever.